We will be holding a staff meeting in the next week or two. It is imperative that everyone responds to this memo with the best time, as we will be introducing each of you to the other, and discussing potential upcoming contracts. We also need to start putting teams together so when we get a contract we can put the best people for the job into place quickly. I will be sending out another memo regarding skills, talents, and workforce desires. As soon as I hear back from everyone, I will schedule the meeting. Social RP event for the Assault Team on 10.24.2014. Where: Mercenary room in the Guild Stronghold on Dromund Kaas. Why? : Why not? Come drink, eat, and tell stories. If we get enough mercs together in one room, we might go blow something up, with lasers and explosives. Jar’rogen was reading a stack of reports when his console began to beep at him insistently and a quick glance at the title sent several datapads detailing odd activities in both the Empire and the Republic clattering to the floor as he brought the message up in full. Woken from a deep sleep Lavaeus bolted upright in bed, throwing the sheets back she stormed from her chambers, her saberstaff coming to her hand as she passed through the door.. The three subordinates present froze as the Sith Lord strode nake into the cockpit of the transport. While most recently full of a cold calculated control, the Sith Assassin was known to have bouts of wild rage, whether this was one or not, none of them were interested in being caught staring. The words were no sooner out of her mouth than Ba’raka was already holding the girl’s little blue body at arm’s length and dipping her into the warm, bubbling water. Ana grimaced. Raana chuckled quietly and lay back against the couch cushions, stretching out as Ana rocked Azanis in a nearby chair. She watched the pair, her mouth turning downward slightly at the look on her sister’s face as she held her newborn niece. Nothing ever changes on the landscape of Korriban. Eons pass, Sith Lords rise and fall, and yet all they achieve is to dig another hole and build another monument on the endless rocky walls that flank the Valley of the Dark Lords. That was the place where the current Sith, heirs to the Old Empire of yore, decided the fate of their peers. And today, the fate being decided was that of a cryptic man. Darth Malefycar had never enjoyed prestige in the Sith Order, nor did he seek it. Regarded as a reclusive Sith since the death of his first master (a smaller Sith Lord of little importance), the recent meteoric rise of the zabrak to the position of Dark Lord had begged many questions, and most remained unanswered to people outside the most influential members of the Dark Council. All in all, it was a fairly uneventful game, so nobody could be faulted for not paying much attention during the moments the camera pans away from a pause in the action long enough to sweep over the crowd, where it likes to pick out particularly well-known or interesting looking individuals. Those with keen eyes, though, and the patience and dedication to keep watching might've spotted a familiar face in the crowd during the third quarter. Leaning against a pillar, a glass of something brown in one hand, was a dark-skinned girl with vibrantly pink hair sporting a Frogdogs jersey. She didn't look particularly thrilled to be there, which only lends weight to the fact that she looked remarkably like Enaeru. It had been 25 years since she had stepped foot in this place…. ICTS is a training simulator offering varying choices to use, along with levels of difficultly of training for any force. Armor is fitted with sensor to measure how much one is hit per simulation. Along with stun rounds to affect the troops running the simulation provide a challenging environment with out causing long term damage to the troops. (ooc- How will this work? Well I will be picking certain flash points and heroics to run as ICTS. Sometimes it will be doing the simple mission asked, other times there will be special instruction. You will know Prior to doing them if there is any special instructions. Dice rolling will be used in this, but it will be a touch different for simulation runs. Read more about There’s no place like… home? Ana felt like she was waking from a coma. When you are unconscious, you dream. And sometimes you struggle to the surface, and it is hard to tell whether you are still dreaming or not. The reality blurs with the dreams and you lose touch with what is real and what is not. Now that our operation on Balmorra is victorious, it is important for the Sith of this order to return to their duties of improving ourselves physically and mentally. Being a Sith means constant learning and eternal growing. We’re perpetual students. The moment we rest upon our laurels, is the moment we become expendable. An air of complacency and mediocrity is spreading through our ranks like a virus. It should and will stop here. 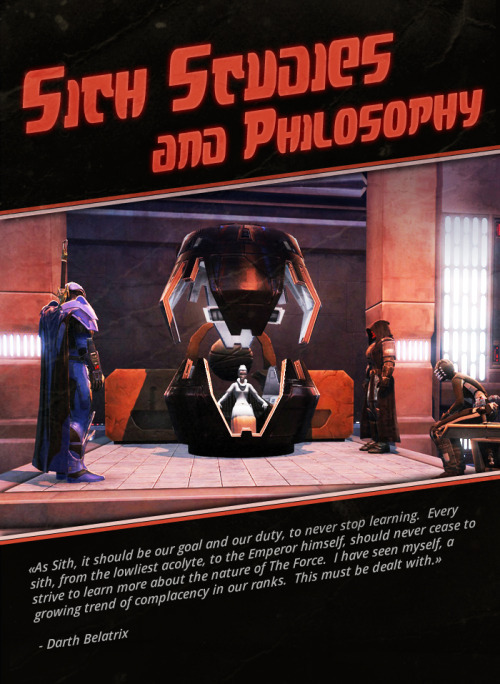 Thursday, 9PM Central Sith Time (CST) I’ll be re-commencing my courses on Sith study and philosophy. As we have several new scholars amongst us, I’ll be starting with basics. The Sith Code, and what it means to be a Sith. All Sith are highly encouraged to attend. Raana left Ba’raka and Tiakos standing in the hallway, staring awkwardly at one another while she gently shut the bedroom door and locked it. She gave them both a look as she ducked back inside, chuckling quietly, “Girl stuff, you boys understand.” Once the door was closed, she turned to Tara. An IC guild meeting will be held on the bridge of the ISS Invicta. The meeting will also have an OOC portion. ICly, we'll be discussing the aftermath of the Battle of Balmorra, as well as what the future holds for the organisation. We'll be discussing Invict's fleet, as well as new headquarters. We'll also be announcing, ICly, the formation of the Imperial Branch, and introducing the officer in charge. OOCly, we'll be discussing plans for future storylines, ship expansion, a general state of the guild, and have a feedback section, where everyone is encouraged to voice their opinions about what we're doing well and what we could do better. i'm looking forward to a strong turn out, as this meeting effects everyone. The Imperial Legion of Project Invicta will encompass all branches for the imperial military (troopers, navel, Intel) so it will give freedom for people to play characters they would like. That said, as it’s a military themed division, there will be some slight limitations. Part of the reason for the development of the imperial division is to provide a great feel for the Empire and more structured theme within the guild. With that in mind, I will be trying to find a balance between structure, character flexibility, and fun. One of the limitations will be the rank you will be able to come in on. I don’t want to take away from a character’s level of experience, but in order to keep thing organised, every character will be assigned 1 of 5 ranks. When coming in the division, I would like to talk first on what rank you will be and what will be expected. The sky had visibly darkened as the imperial armada moved in and began their orbital assault on the planet. A green hue casts over the land and the horrifying sound of the dreadnaughts cannons filled the air. The cannons stopped and squadrons of bombers shrieked through the sky dropping more pin-pointed attacks on anti-infantry emplacements making way for the wave of troops waiting to storm the gates and take the factories. Ana started when Ba’raka stepped into the room, hiding something behind her back. The room was an absolute mess, strewn with clothes EVERYWHERE. Every closet in the ship had been torn apart it seemed and he noted from the corner of his eyes that one wall seemed oddly bare. He was pretty sure something had been hanging there when he left earlier that morning. He approached, folding his arms over his chest. A debris field grows, slowly and inexorably, around the war-torn planet of Balmorra. Discarded shipping containers, failed escape pods, and jettisoned engine cores litter the black, twisting slowly in the silence. Now and then, the planet's gravity well pulls something just a little too close, and it leaves a brilliant streak through the sky as it dies. Raana paced back and forth across the hangar floor until Tiakos finally reached out a hand to stop her. Before she could jerk her arm away he tugged her in close, his open palm sliding across her round, firm belly. After a quick swat to silence the alarm Jar’rogen leaned back into his chair and took a deep breath as he began to take a short break from the stacks of datapads on his desk, each containing some kind of report that either due to worth, or some ones connections, had ended up in front of him for review. Not long ago he discovered how much it helped if ever so often he took fifteen minutes or so, ever so often, to stop thinking about anything related to the work before him. Once again his eyes swept over to the folded up shirt that had come to dominate one out of the way spot of his desk as memories of tastes, sounds and physical sensations drifted through his mind along with many of the questions he had been asked, questions he now asked himself. Tara wiped her brow with the back of her hand. It seemed the spices she added to the strips of nerf steak were a little more pungent than she had expected. She took a handful of green, leafy herbs to bring the temperature down. Tasting a slice, she nods to herself and slides the meat onto the serving platter to rest. She'd spent a good amount of time on the gravy sauce it was cooked in, but didn't see it as an inconvenience because she had a date with the man she loved.